For cost saving, flexibility and high-speed data transmission using PoE power provision, all of the 10/100/1000Mbps copper ports of PLANET GSD-802PS provide PoE power injector function which is able to drive 8 IEEE 802.3af compliant powered devices with maximum up to 15.4 watts of power per port. With data and PoE, the GSD-802PS can reduce cables and eliminate the need for electrical outlets on the wall, ceiling or any unreachable place. A wire carries both data and power, thus lowering the installation costs, simplifying the installation effort and eliminating the need for electricians or extension cords. The key feature of the GSD-802PS is energy saving. With more efficient switching power supply, the efficiency of the GSD-802PS would be much better than four linear power adapters in the long run. Furthermore, it is the ideal device for bridging among Ethernet, Fast Ethernet and Gigabit Ethernet workgroups and networks. With Gigabit throughput supported, the Gigabit PoE switch won’t be the bottleneck of a PoE networking environment anymore. With 16Gbps non-blocking switch fabric, 8K MAC address table and IEEE 802.3x full-duplex flow control, the GSD-802PS offers wire-speed packet transfer performance without risking of packet loss. The two Gigabit SFP (Small Factor Pluggable) slots can be installed with 1000Base-SX / LX mini-GBIC modules which offer incredible extensibility, flexibility and connectivity to the core switch or servers. For efficient management and with its built-in Web-based management, the GSD-802PS offers an easy-to-use and configuration facility. The smart functions make it easy to survey and control the PoE power provision via the web interface. 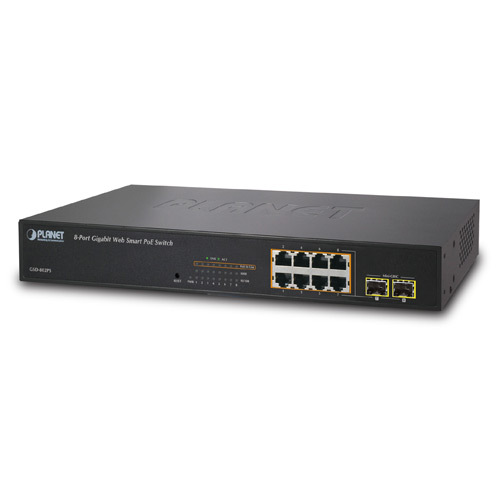 The GSD-802PS can be programmed for basic switch management functions such as per port speed duplex settings, Port Trunking, VLAN, Port Mirroring, Rapid Spanning Tree, 802.1X network security authentication and Misc Configuration. Additionally, the firmware includes advanced features, such as PoE control, IGMP snooping, QoS (Quality of Service), broadcast storm and bandwidth control to enhance bandwidth utilization. Providing up to 8 PoE, in-line power interfaces, the GSD-802PS can easily build a power centrally-controlled IP phone system, IP Camera system and AP group for the enterprises. For instance, 8 cameras / APs can be easily installed around the corner in the company for surveillance demands or build a wireless roaming environment in the office. Without the power-socket limitation, the GSD-802PS makes the installation of cameras or WLAN AP easier and more efficient. -Auto-negotiation 10/100/1000Mbps full and half duplex mode selection. -Flow control disable / enable. 2011-04-13 2.0 Release for Hardware version 2.0.